Fastest Fall Dinner Ever: 5-Ingredient Spicy Pumpkin Soup with Chorizo! / Hey, EEP! 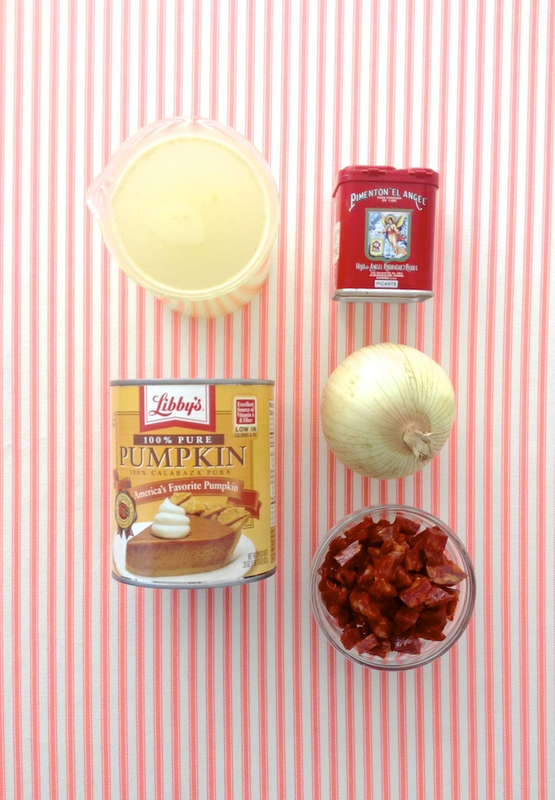 Fastest Fall Dinner Ever: 5-Ingredient Spicy Pumpkin Soup with Chorizo! During a shoot this week, our camera man told me about how his lovely girl friends makes big pots of soup for him once fall hits. It's her creative solution for having a partner with long, unpredictable work hours. Soup's the perfect solution! It's cozy, make-ahead and easy to reheat when one (or both) of you get home from work late. I'm curious: What's your meal schedule like? Do you and your S.O eat together? Dine in shifts? I'd love to know! Since starting this new TV job, I never seem to make it home in time for dinner. It's been a big adjustment: Not only do I feel guilty about not being able to cook for boyfriend, I feel awful asking him to wait to eat his dinner until I come home. I'm curious: What's your meal schedule like? Do you eat together? Dine in shifts? I'd love to know! 1. Cook the chorizo in a saucepan over medium heat, stirring occasionally, until crisp and drippings release into man (you should have about 2 tablespoons drippings. If not, add a slash of olive oil). Transfer chorizo to a paper towel–lined plate using a slotted spoon. 2. To the saucepan, add the onion and cook, stirring occasionally, until soft, about 6 minutes. Stir in the pumpkin, chicken broth, paprika, and salt and pepper to taste. Bring to a simmer, stirring occasionally, about 7 minutes. 3. Divide the soup among bowls. Top with the chorizo and more paprika, if desired.